Article by Susan Lanigan ©. Posted in Resources (Selling Your Book). If there is a list of “Things I Wish I’d Known When I Got Published” knocking around, my number one would be that an author needs to get good at marketing. This is regardless of whether you self-publish or go the traditional route. In my case, I had a publisher with a budget and an ability to organise promotions and PR. But it is a tough industry in which to establish a name for yourself long-term. As an author I’ve learned I have to be out there front and centre making myself known to the people who are interested in selling, buying or promoting my book. I needed, in short, to develop a brand. And to do that, the small, humble business card was my vade mecum. But why did it end up being so important in my author’s arsenal of marketing? After all, usually when people think of business cards, they think of business meetings in banks or offices. 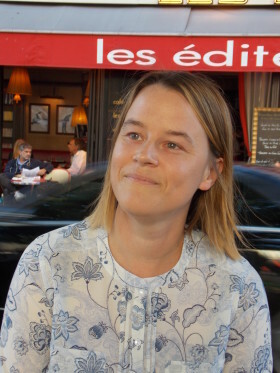 Author and lawyer Andrea Carter notes: “Although as a solicitor I had business cards, I thought as an author I wouldn’t need them.” So, what is the appeal? On the other side I had a smaller rendering of the cover, vertically this time, with a brief description of the novel, the award it was nominated for, and website details. In the bookshop, I soon realised that these cards were doing me no good when in my hands or on the table. Customers drifted in and out, casting the occasional glance my way, but nothing was happening. Until I started the Business Card Magic. This worked as follows: I would keep an eye out for anyone who looked curious about approaching me but didn’t want to leave their bubble. I went up and approached them instead! I would go to them and say “I’m doing a signing today, my novel’s called White Feathers, and here’s my card if you’re interested in finding out more.” Now normally I would not have the brass bollards to dare approach people – I find it very difficult to overcome shyness – but with the business cards, I had a perfect weapon. Because I had something to give the customer, rather than something to ask of them. This is so important. It is something that makes the whole process of making yourself and your work known to someone so much easier. Of course you want to gain a transaction, but it’s better to give the initiative back to the person of interest, rather than constantly pushing empty handed. To my pleasure, and Lisa’s, once I got my Business Card mojo going, I sold every copy of White Feathers in the shop. Result! Thirdly, it just saves time. While the plot of White Feathers is relatively easy for me to pitch – because it’s a good one – it’s still a conversational effort. I should know, I did it twelve times at the 2013 Irish Writers’ Centre Novel Fair! Whenever I am talking to colleagues or acquaintances about my book, I’m aware that a possible sale is in the offing. But rather than be explaining, and potentially losing, and potentially appearing rude, I can just hand over the card, which sums up the bare bones and directs them to my website or the publisher’s if they wish to find out more. So for all those authors who are cringing at the thought of getting out there and promoting their work, I feel your pain – and heartily recommend the business card as your sine qua non. Go forth and network, my friends! 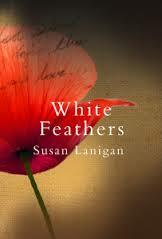 Susan Lanigan is the author of historical WWI novel White Feathers (Brandon, 2014) which was shortlisted for the Romantic Novel of the Year Award 2015. More information about Susan and her novel can be found at her website: susanlanigan.com. White Feathers is available online here!